I've never built a war wagon before for a DBA army. The wagon and oxen came from a trade with Dennis (old Minifigs). The figures are from Scott (Old Glory) and the rider is from Conquest Games. I may add a standard and some more shields to the wagon to make it look a bit more military, rather than the hay cart it is. Overall, I'm a little "meh" about the wagon. The individual pieces are okay but together they are something of a mess--so many elements on the base it was hard to get a decent snap of it. Anyhow, done is done and I guess we see how this works in a game. Up next: A 28mm HoTT Skaven army is underway--flesh, hair and metal done--now moving onto their clothes and the details. Nice figures. 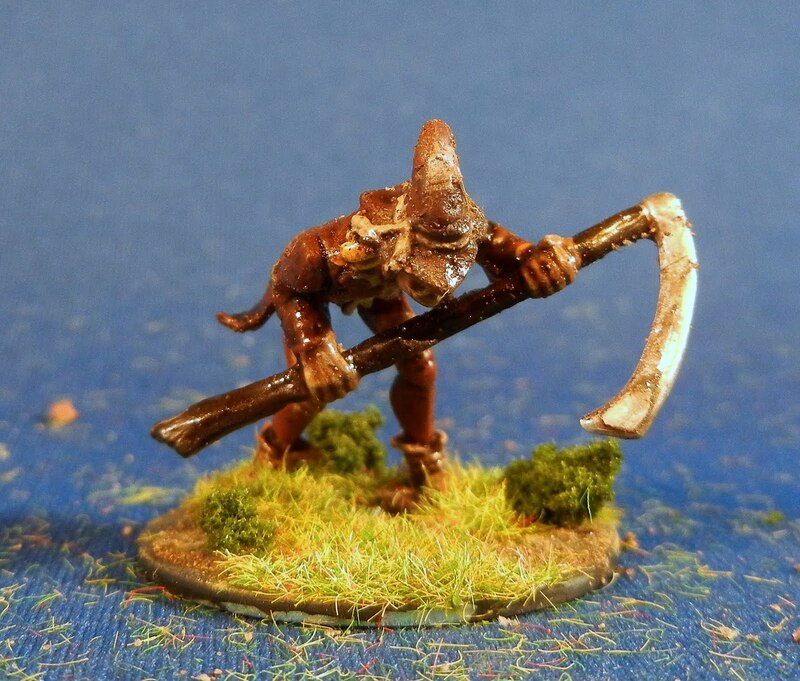 And I will primer some more 28mm metal medievals this afternoon. I have finally brought my 28mm Norman army to completion. 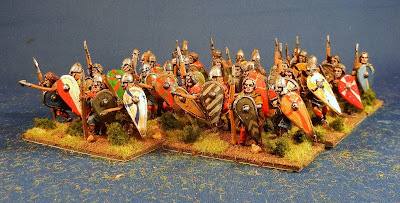 These last bases of spear have been staring at me for some time. These are mostly Old Glory (I think) that I got in trade from Scott. I'm not thrilled with how they turned out (the shields look like fishing lures!) but I am happy they are done. I have a War Wagon that is drying that I will post-up tomorrow that complete the army. It will have to share a camp with the Saxons unless I get ambitious one day. 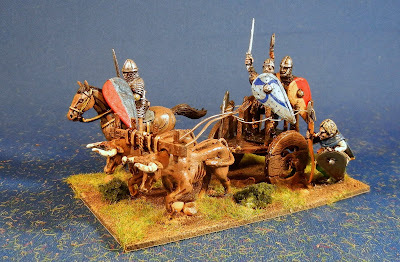 Up next: A 28mm Norman War Wagon, some 28mm Skaven for HoTT are being painted and some miscellaneous 28mm medievals are about to be primered.Thereafter maybe some 1/72 AWI--hard to say. 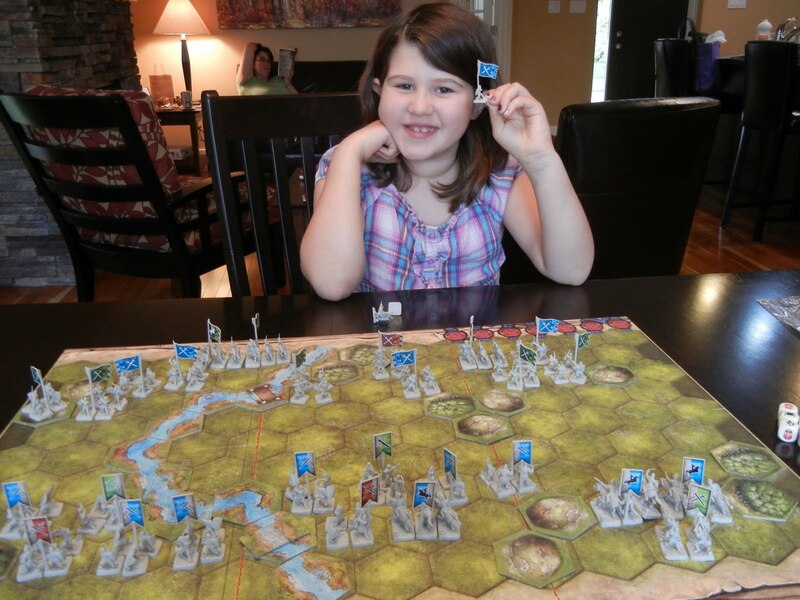 Jess suggested we pass a rainy evening playing some Battlelore. I chalk this up to reading the Hobbit to her at bed time. Anyhow, out came the game and off we went using one of the basic introductory scenarios. Jess played pretty well (for a seven-year-old) and managed to put me back on my heels with her aggressive style. I keep forgetting that the optimal move is invisible for her and she tends to simply lash out. Her she is running down my cavalry with her heavies, followed by another pursuit and beating of my foot. Below you can see her trash talking me, although note the banner count. She took defeat pretty well, all told. 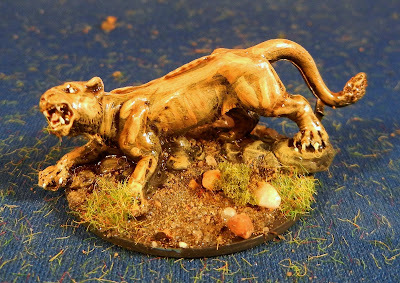 Up next: I am about to base a bunch of 28mm Normans (awaiting the decals drying) and I've started painting on a bunch of GW skaven for a HoTT ratmen army. Nice figures. 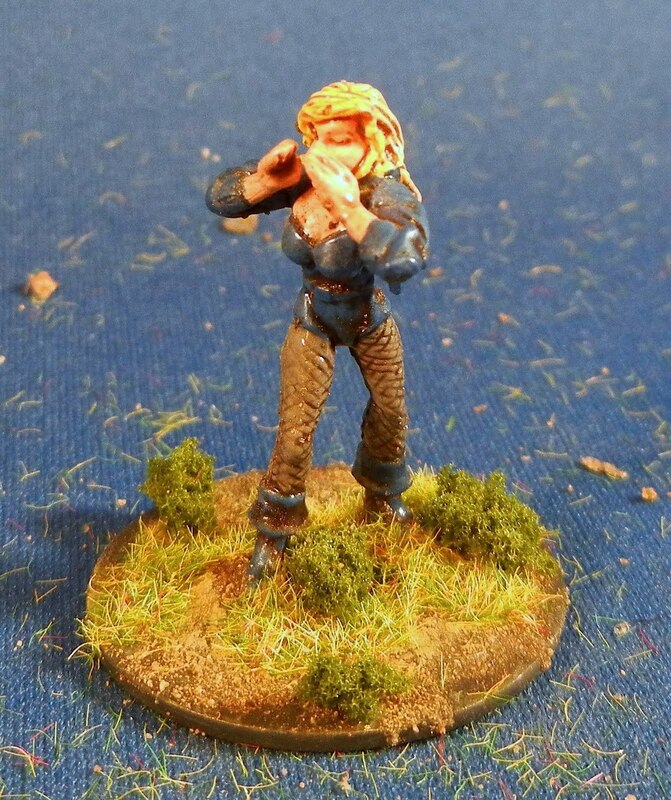 Crazy prices but very nice to paint and a pleasant distraction from horse and musket. After them perhaps a few more Normans for a war wagon and then I'm not sure what. Maybe some 1/72 AWI. 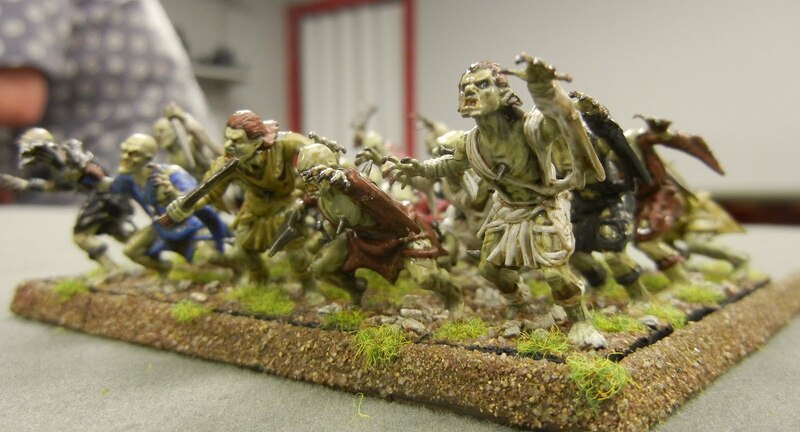 I also have a 15mm zombie commission on the way. 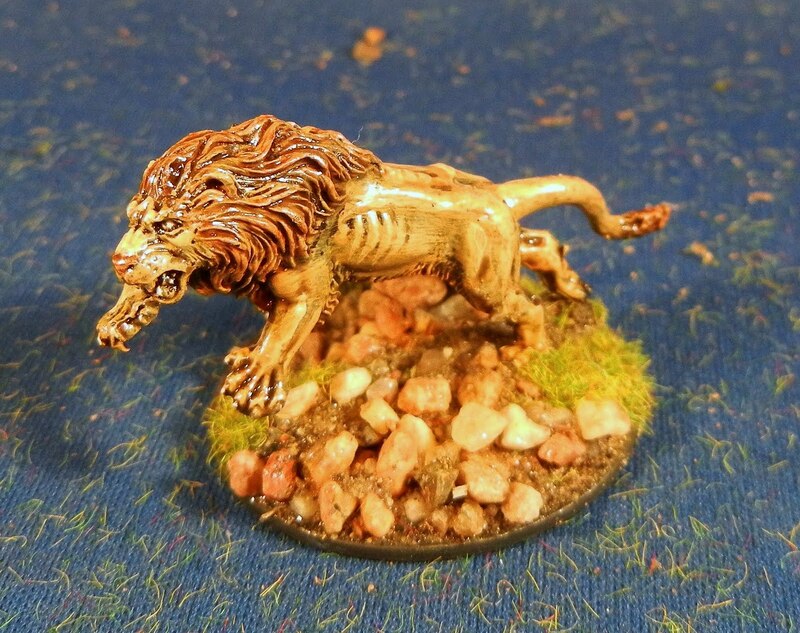 I was cleaning out some boxes and I found six 28mm lions. I believe these were from a Samurai army I traded to Scott (hah!) and were part of the fantasy element he wasn't interested in. So I painted these up. 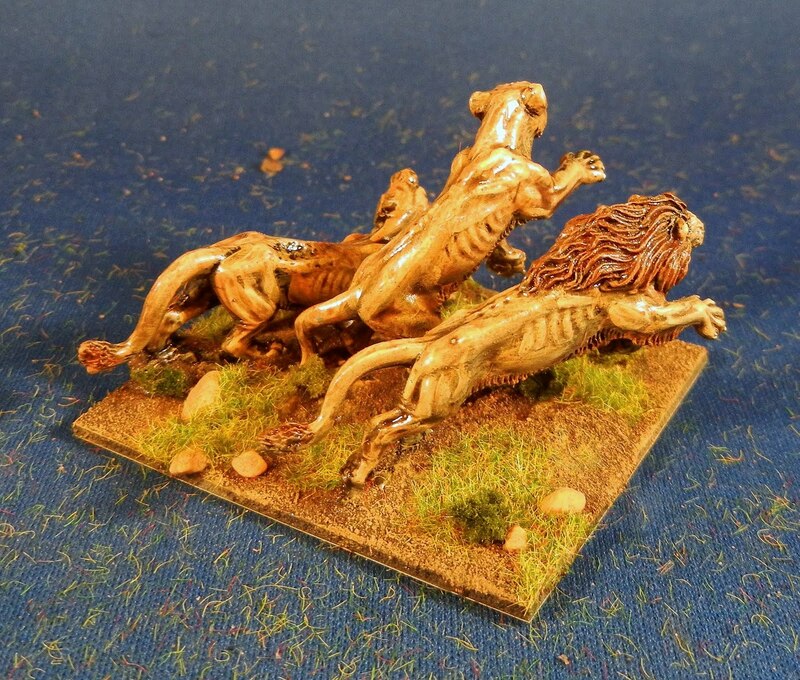 The first base of three would be beasts in HoTT and I've put then on my shelf with the medieval armies. I think these turned out okay--there is enough shadow and depth to the paint job. I based the second set of three individually. 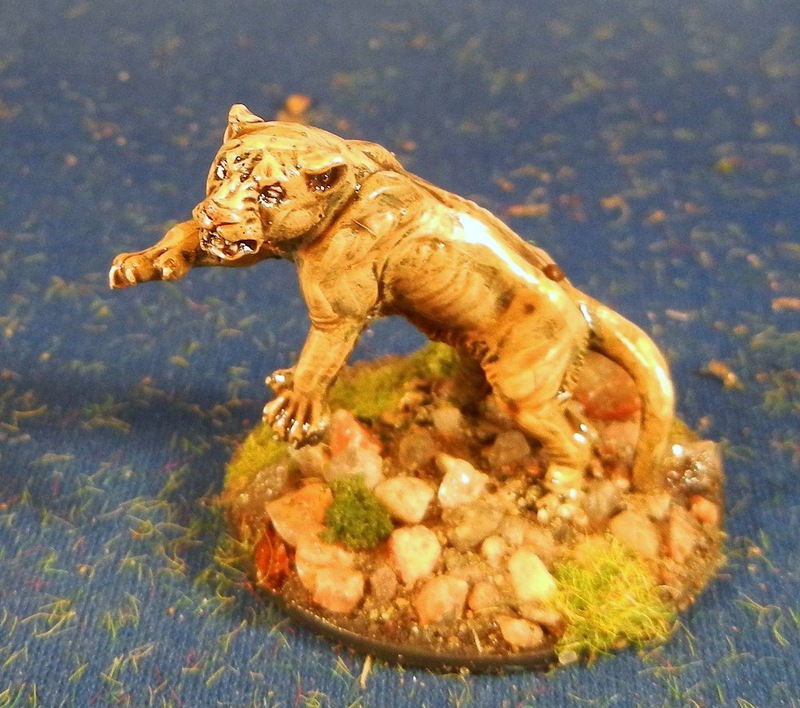 These could be used in a superhero or pulp game as wild animals. Perhaps Catwoman's minions? 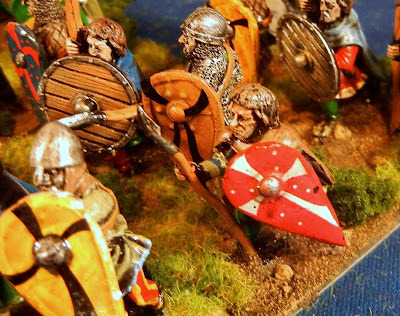 Up next: I finished painting the remaining 28mm Normans and now I'll move onto decaling and basing them. I also have the war wagon complete and am just working on painting up a few riders to populate it. Then onto some ratmen for HoTT. 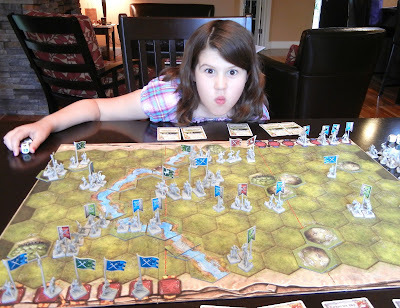 Jess is also eager to play some more Battlelore--perhaps I'm due to win a game? With these figures. my War of 1812 project is largely complete, with plenty of time to prep terrain and scenarios. First off the production line are these two bases of American dragoons. These are Imex AWI Americans and perhaps Italeri AWI horses. 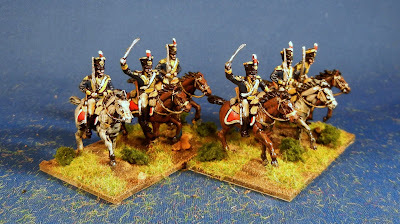 I thought about doing proper cavalry figures (and I may yet) but I like to think of American dragoons as a bit rough and ready. These three bases are loosely painted based on Pennsylvania militia. They are Imex Alamo figures--I love the top hats! This is a generic militia unit with summer green jackets. And below we have two bases of skirmishers with a woodsie theme (Imex AWI, I think). Up next: I have some 28mm lions (?) 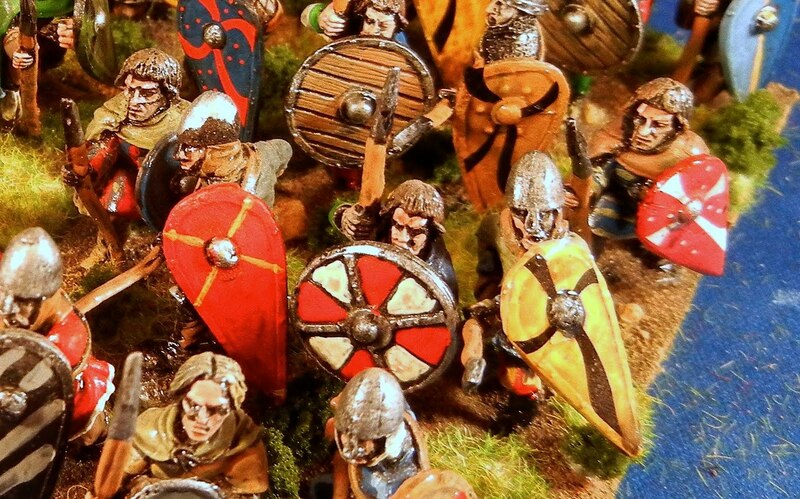 that need to be based and I've made some progress on my 28mm Normans (including a cool war wagon). 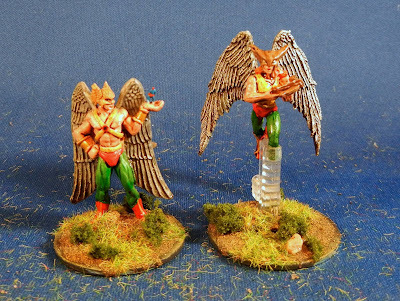 After than some fantasy figures and perhaps some superheroes--I've rethought their basing some and have ordered some cobblestone bases. 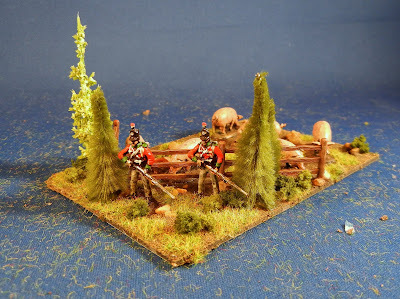 I needed a camp for my British War of 1812 troops. 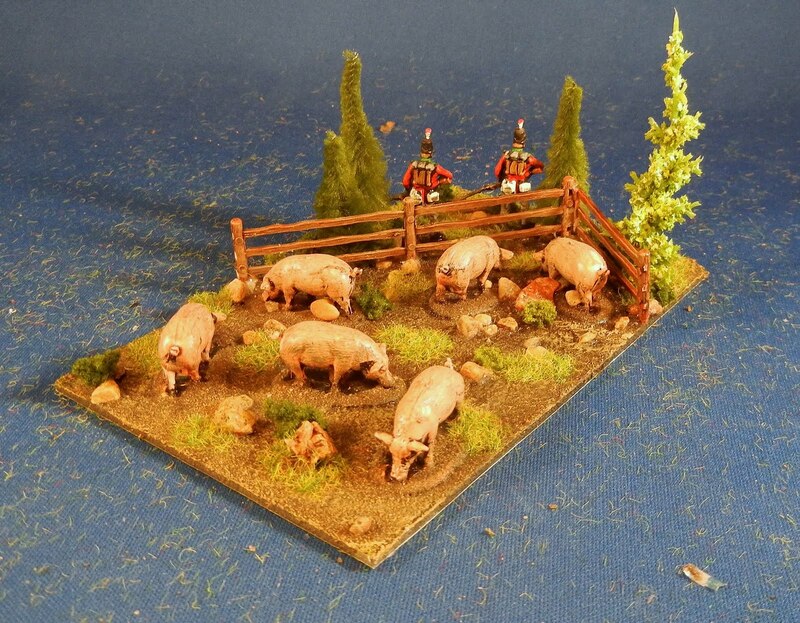 I thought about doing something military (e.g., redoubt, officer's tent) so I started rooting through my box of extras and ran across a bunch of pigs. And then I thought "imperialist pigs!" (I'd had a fair bit of caffeine at that point). And then I thought, "hey, I know". And thus was borne my British camp, wherein two poor privates are forced to pull sentry duty, guarding dinner from bears, tigers and hill-billies. The fence is an old railway model that I won as part of a job lot at the EWG auction this spring. The pigs are from an Imex pioneer set. 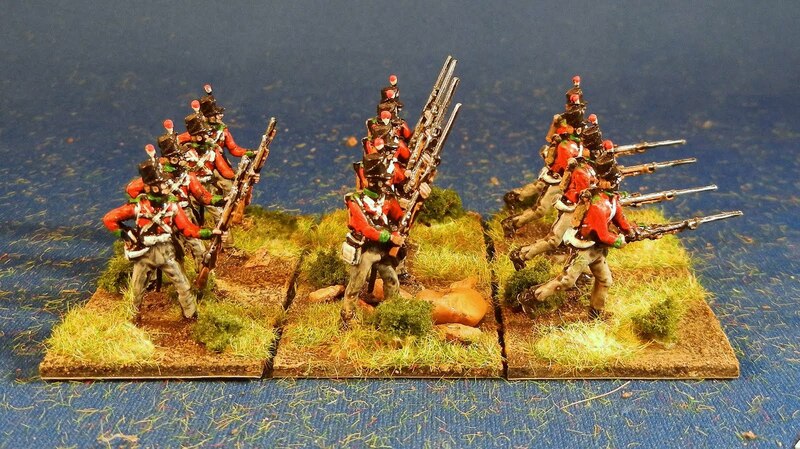 And the soldiers are Revell Napoleonic British Riflemen. Up next: American militia and dragoons are drying. I have started to block in colours on some 28mm Normans. And I built me a bunch of ratmen yesterday for a HoTT army so I will prime them today if the weather cooperates and berry picking doe snot take too long! 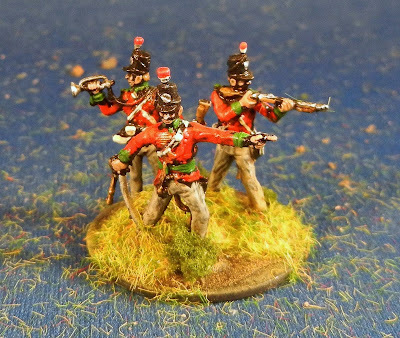 I'm basically finished the figures I need for gaming the War of 1812 over the next three years. So now I'm just painting up various surplus 1/72 plastics that I picked up to give me some options to have multiple player games. These are some Revell British rifles. I think I bought them for a specific purpose that now eludes me so I simply painted them as British regulars to flesh out the forces of his majesty. These were nice enough figures. The soft plastic took primer and paint quite nicely and nothing flaked off during basing. There was quite a lot of detail in the sculpt but it was shalow, so picking out straps was not as easy as with, say, HaT or Imex figures I have done. 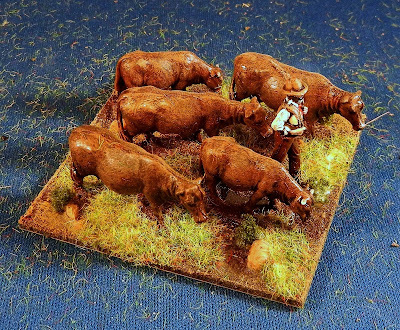 I also raided an Imex pioneers set for some cattle. 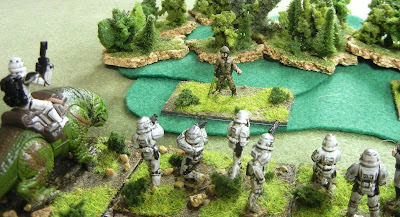 This base could be used as an objective in a game or, in a pinch, as a camp. 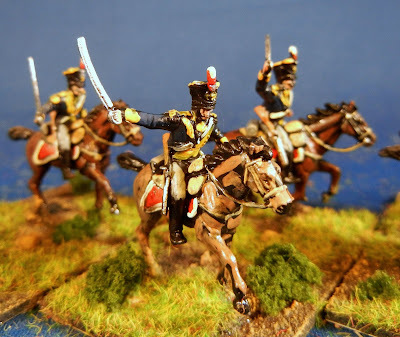 Up next: The remainder of the 1812 US troops, including some dragoons and militia. Also I have have done a nice little British camp. All of this is just being based up now. Then onto some 28mm Normans and then maybe some skaven for a HoTT army? 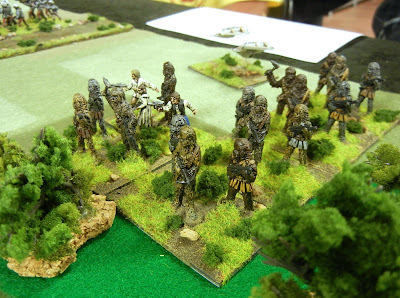 Table Top Gaming News has published a review of Hail Caesar that the guys at the club helped me playtest. Thanks guys! We had eight guys out at the club last night with two games running. 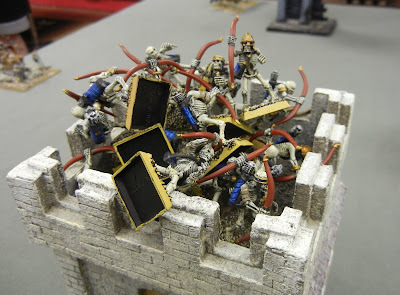 Dave and Scott played a Tomb Kings v. Vampire Count undead throwdown with WHFB. Turned out to be a real throw down as Scott fumbled a skeleton late in the game and ended up stepping on it. 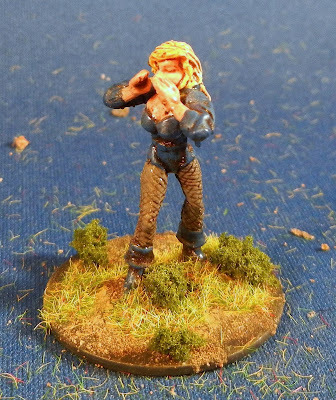 We were joined by the GW Finecast Project Team. Oh, no, wait. These are some of Dave's Mantic zombies, marching to destroy Scott's GW army using the Lore of Competitive Pricing and Alternative Game Engine. 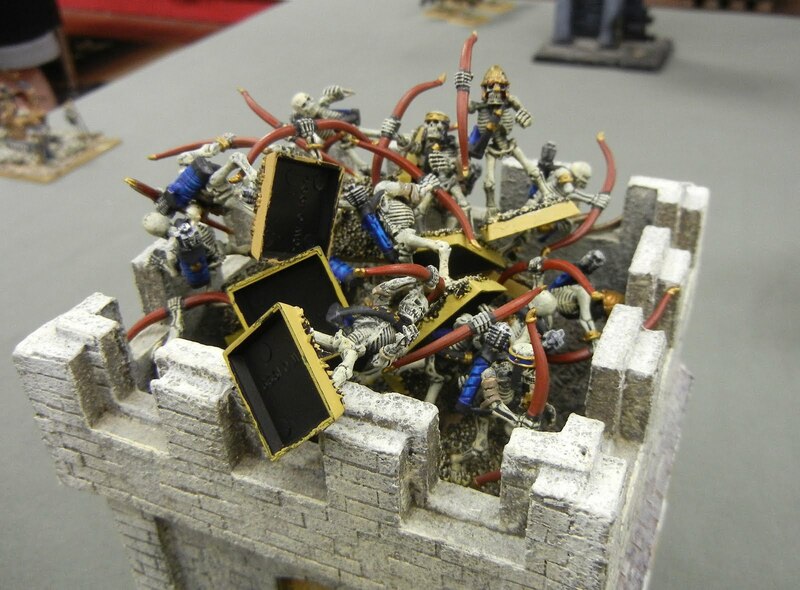 You can see the disarray on the GW side, with half-heartened deployment and troops holed up in their tower. Chen, Barry, Terry and I played two games of HoTT Star Wars. For this first outing of "my daughter's Star Wars armies", I simply assigned each base a unit type, rather than using the Star Wars adaptation on the web. I may give this a go at a later date. 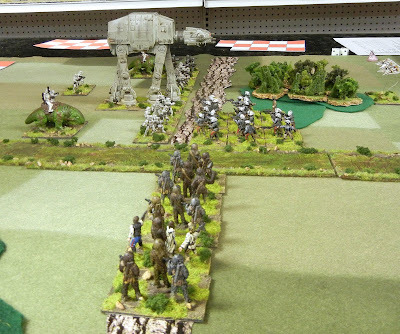 There were two rebel armies, each with 14-16 AP and throwing 1d4 for pips against a single imperial army (24 AP, 1d6 pips). It was a straight up encounter with no stronghold. 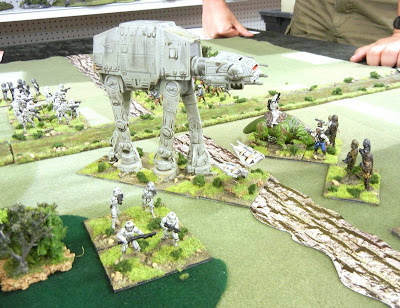 The first game saw the Imperials deploy on either side of the river, attempting to get good match-ups (e.g., AT-AT on Warband). In the foreground, Chen's wookie command would eventually destroy both of these Dewbacks as well as the AT-AT walker. 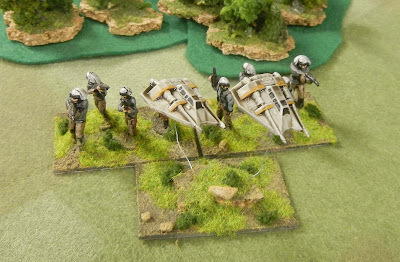 In the background, Terry's rebel troopers would hold the imperials and eventually work a speeder flight around behind for some flanking attacks. In game two, the Imperials deployed on one side of the river, requiring the wookie command to cross it. 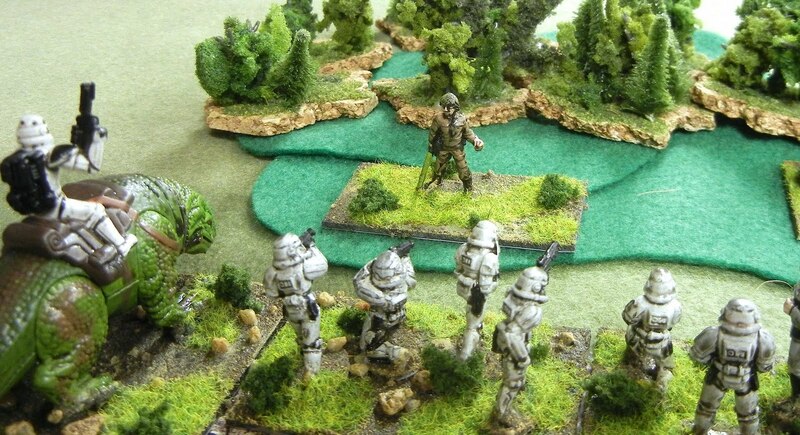 Barry made haste but found that his access to the other side at the ford was blocked by a big smack down between Chen's rebel troopers and Terry's stormtroopers. Barry then spent a frustrating 20 minutes trying to wade the river and join the fight. 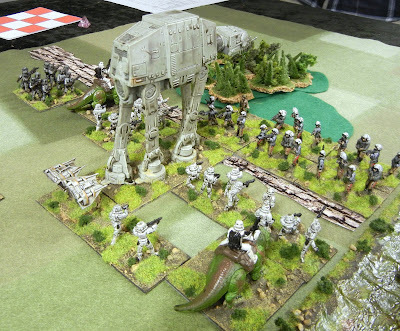 Terry was able to defeat each of the rebel armies separately, although you can see a unit of speeders worked its way around behind him, flew through the gauntlet of shooters and flank the AT-AT (which was killed). Brave Luke Skywalker, hero general, spent much of the game in the forest, trying not to get greased by the large number of troopers headed his way. 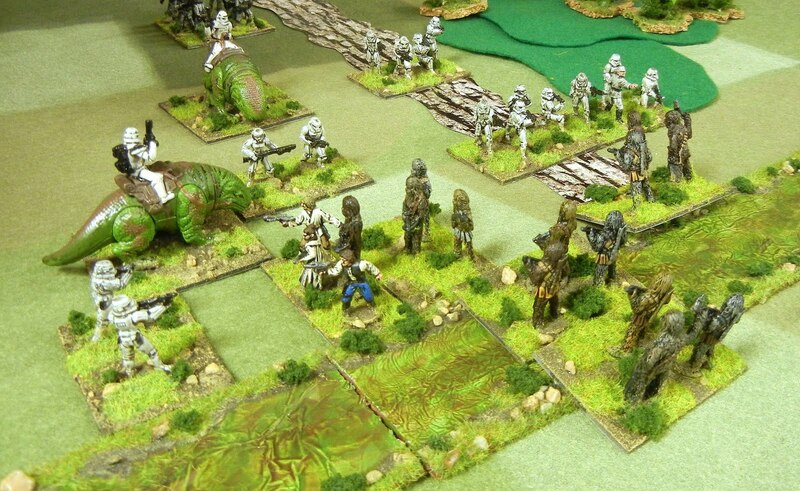 When his army finally bugged out, he left the poor wookies to finish crossing the river and take on the might of the imperial army themselves. 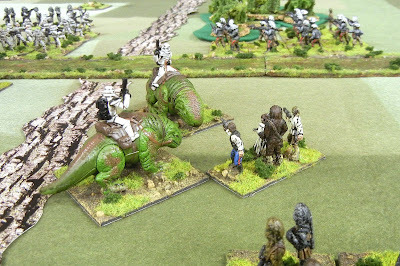 An extended see-saw battle allowed Barry to bring more wookies into the fray than we'd though, but eventually his general unit (Han, Chewie, Leia and Luke) were trapped and destroyed, bringing the second game to an end. Overall, a reasonably fun pair of games. Next time we'll try the shooter-heavy adaptation I found online. 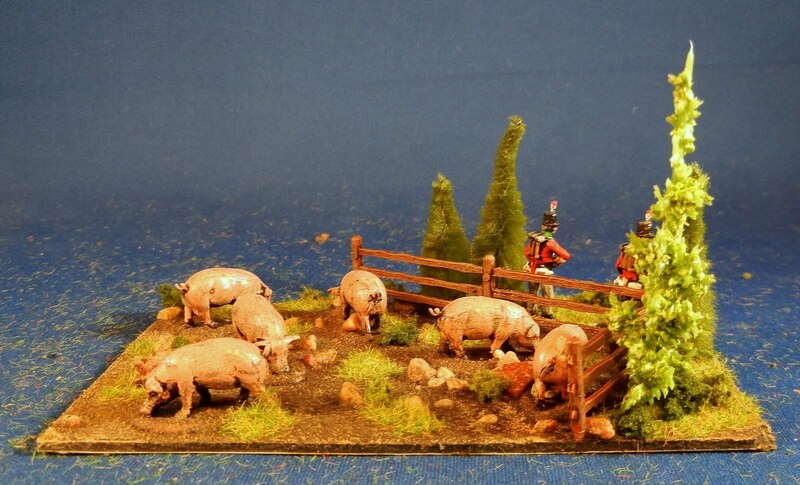 Up next: Some War of 1812 British troops are awaiting basing. And I have some War of 1812 American units to finish and then I think I am done that project! I also have the remaining 28mm Normans primered and awaiting paint. Last night, Mark and I played two games of Hold the Line, Worthington Games' re-issue of Clash for a Continent. Unusually, we played outdoors which was a nice way to take advantage of a lovely summer evening. This re-issue has very nice components when compared with the original game. 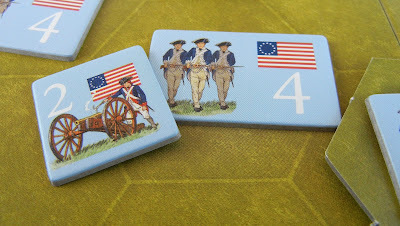 We played the Trenton scenario twice, each winning as the Americans, although each of us lost George Washington in the fighting. The game is won by the first side to six victory points which, practically, means the first side to take six units from the other. 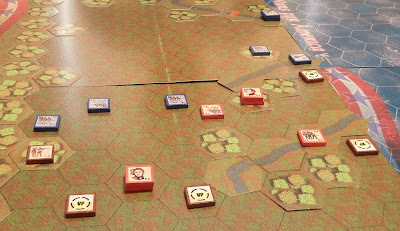 There is also one victory point on the board and the British can gain a small number of points by retreating across the bridge in the bottom right of the photo. The odds and action points are stacked against the Brits (which is historical). In both games, the American tried to tighten the noose, while blocking the bridge exit. Mark was aggressive on the bottom of the picture, jumping a good unit out to bag Washington and then try to roll up the American troops around the bridge. 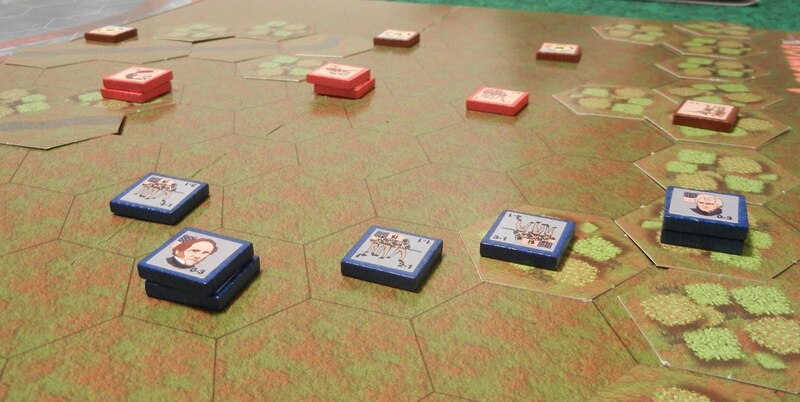 When Iawas the British, I was aggressive at the top of the picture, trying to isolate and roll up the Americans on the hill. Neither of us lasted to the half-way point of the game, with Mark lasting slightly longer than I did. 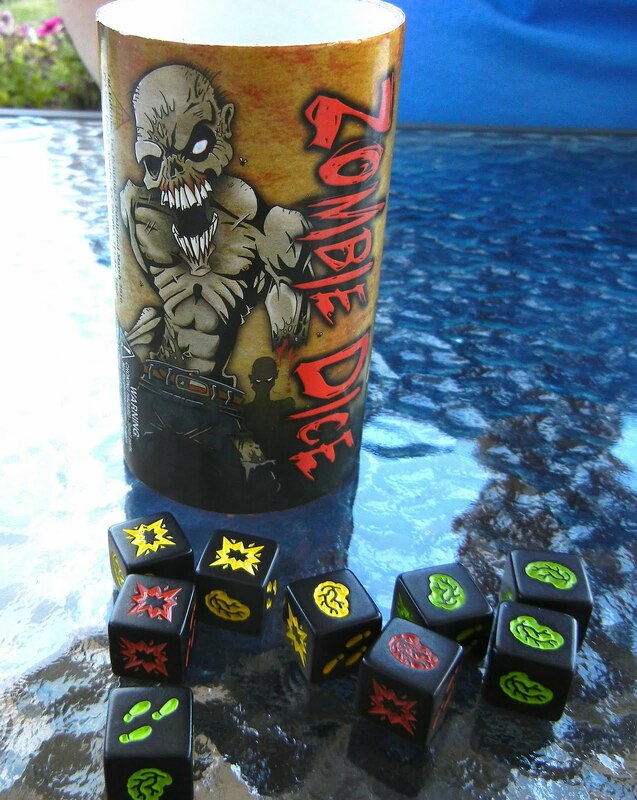 Mark then brought out Zombie dice and we played two quick games of that. A fun game suitable for kids and non-gamers but with enough choices to make it fun for us too. 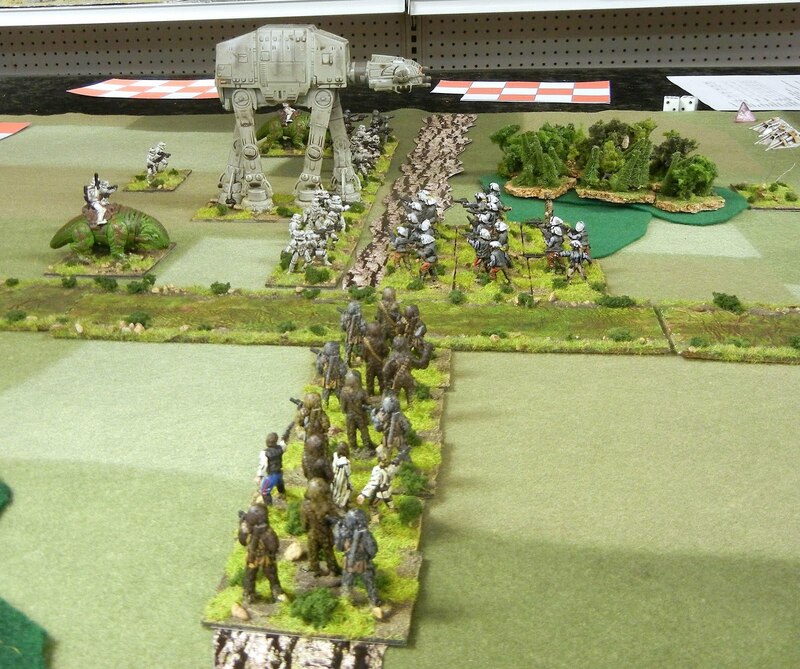 Up next: Some Star Wars HoTT on Tuesday night at the club. And some War of 1812 British are almost done being painted. 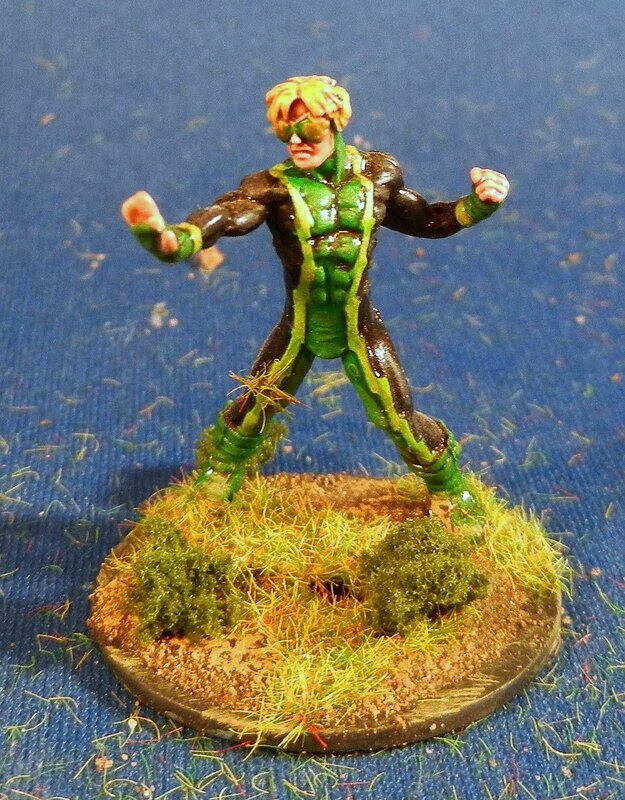 I managed some additional repaints of my collection of DC Heroclix figures. This is negative women from the Doom Patrol. 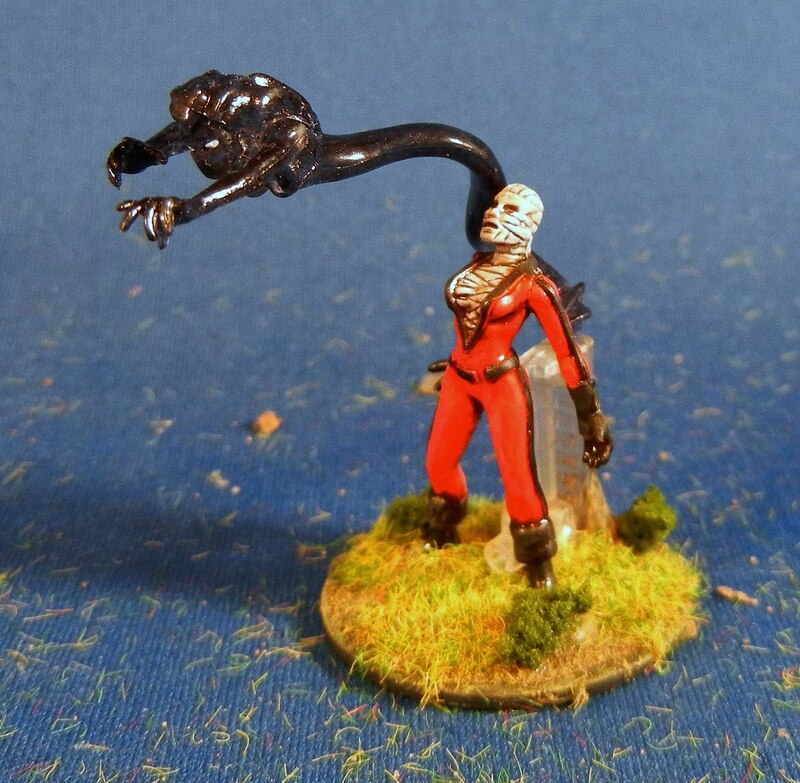 The shadow part of her is actually translucent, which does not show up well in the picture. And there is more subtlety to the red than shows up here. The is Black Canary, love interest of Green Arrow. I don't recall her superpower (hooking?) but maybe it had to do with her voice. This is Inertia. I don't recall him from the comics of my childhood. He could be repainted as GeoForce. 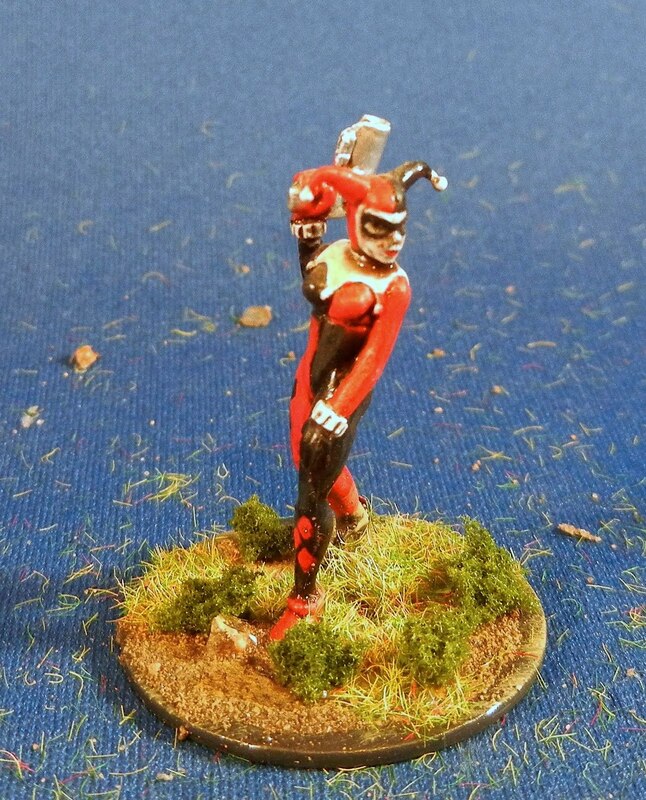 There is a fellow in the UK offering to repaint and rebase heroclix for 40 pounds each. He does nice work, but not much better than this. Scarecrow is a nice villain figure but being sculpted bent over, it is hard to see this. This is Harlequin, another villain from Batman's stable. And below we have Hawkman (holding Atom) and Hawkgirl. Apologies these shots are soft--the camera insisted on focusing on their wings. Up next: Some War of 1812 British regulars. Maybe a game with Mark this weekend. And then the club on Tuesday. 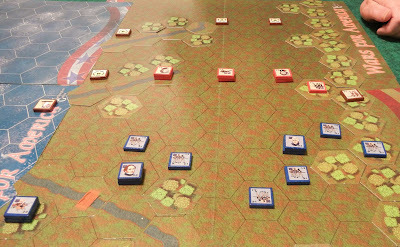 I dropped in on Bruce last night and we played two games of For Honor and Glory, Worthington Games' War of 1812 block game. We chose the Crysler's Farm scenario. 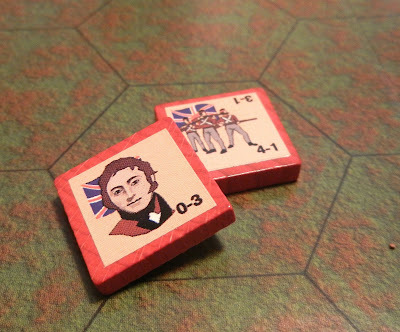 I played the British first and was fortunate to put one of Bruce's commanders out of the game early on, which put him at a huge pip disadvantage. 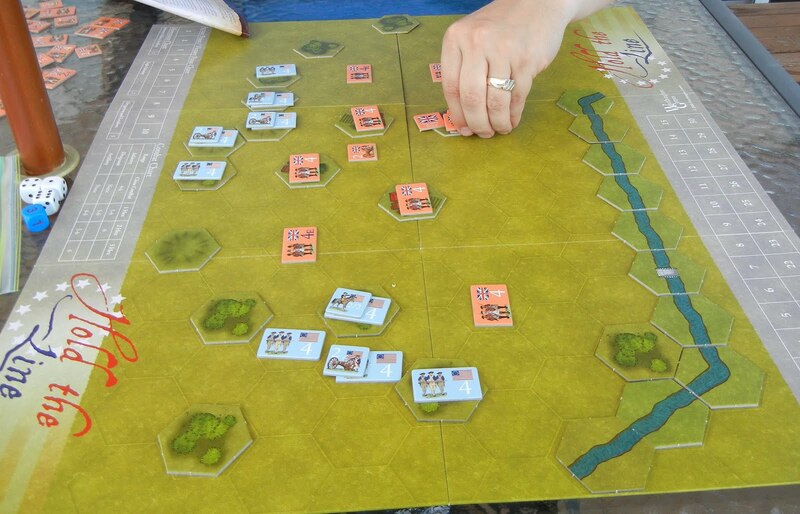 Alas, I did not pay enough attention to the gunboat on the river and ended up losing it to some cannon fire. 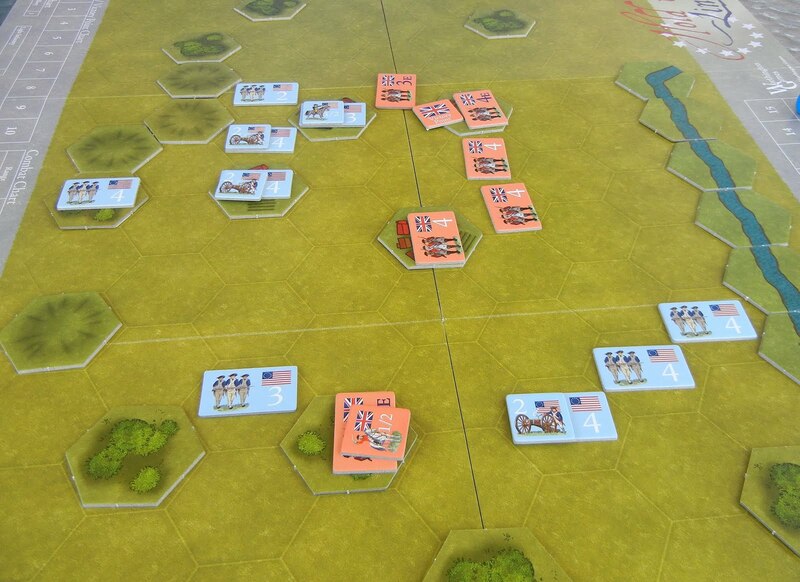 In the end, the Americans ran out of time and troops, not unlike the actual battle. We then switched sides. 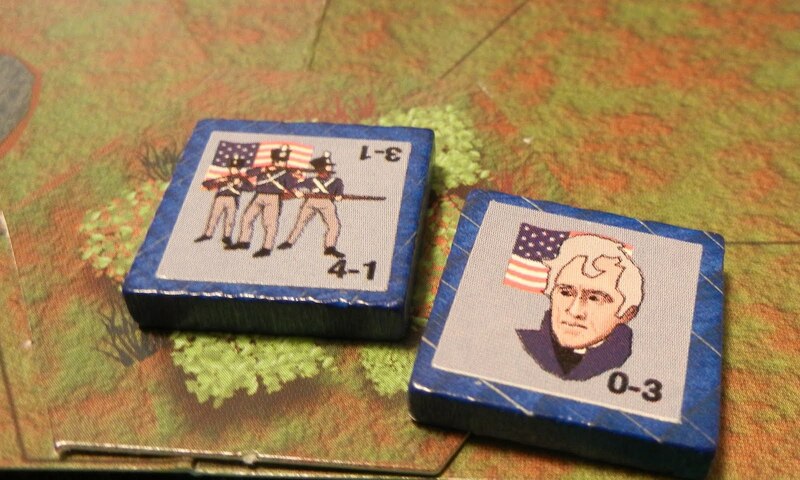 As the American I too had trouble sustaining a decent advance in the face of endless British command pips and withering fire. 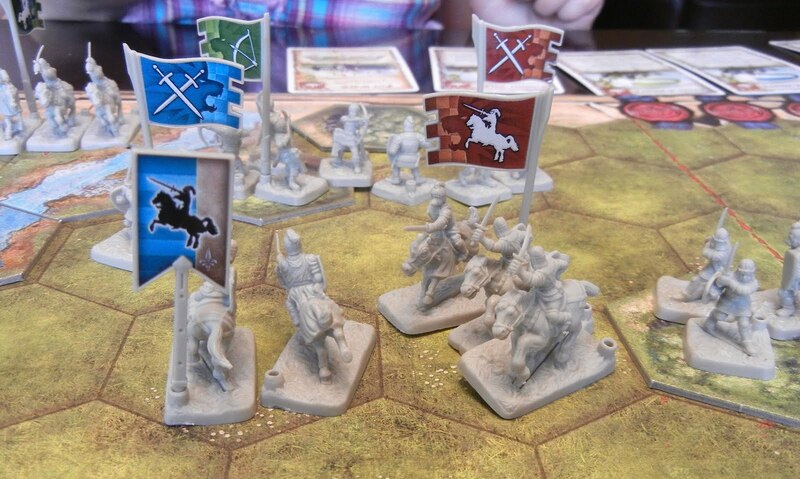 I tried to use my commanders to rally troops when perhaps force marching them might have been better. I also ignored Bruce's gunboat, which might have been a mistake. I got to about the same spot at Bruce before running out of troops and time. I'm not sure this was the best scenario to start with--the troop density was quite low. But I had a reasonably good time. Bruce commented it did not feel like linear warfare. I'd agree with that as area movement isn't the same as lining up troops in DBHx. That said, it nicely modelled command choices like trading space for time, having to prioritize some actions over others. It also integrated land and naval combat very seamlessly. 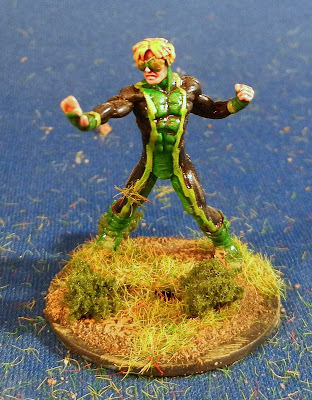 Up next: Some 28mm superheroes. Then some more 1812 figures, although likely not until early next week. The club is Tuesday and I think I will put on a game of Star Wars HoTT. These 12 fellows are HaT Prussians that I have painted up to represent British cavalry during the War of 1812. I did two bases of cavalry (3 models each). These were nice figures--well sculpted, the riders fit the horses snugly, and the detail was accessible. 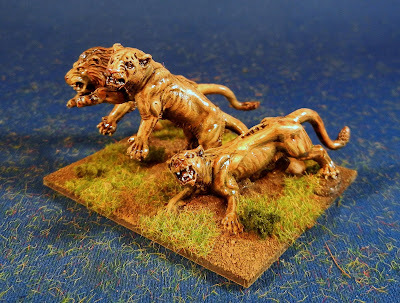 I also did three bases of dragoons. You can see the carbine (or whatever they carried) below their right arm. 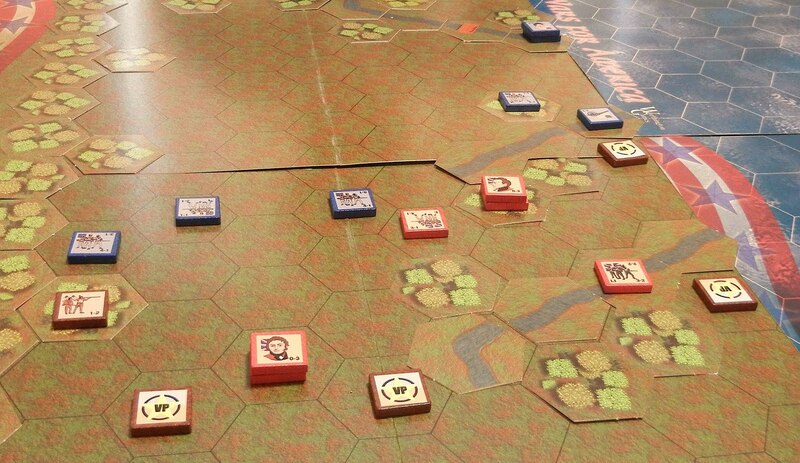 Up next: Some gaming with Bruce tonight (War of 1812, as it happens) and then some superheroes later this week. Then back to some more 1812 figures--this time more British regulars and then some American irregulars. 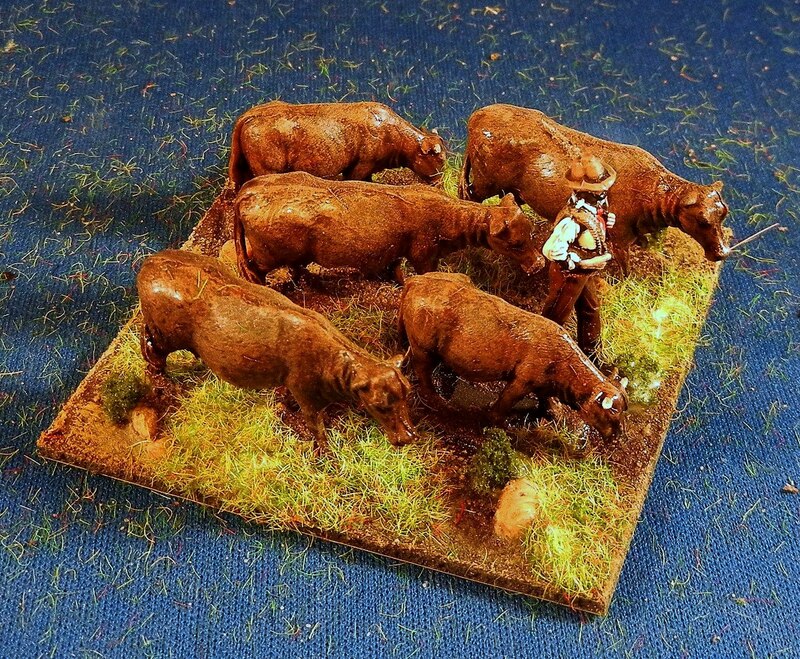 And perhaps a British camp and a cattle drive base.